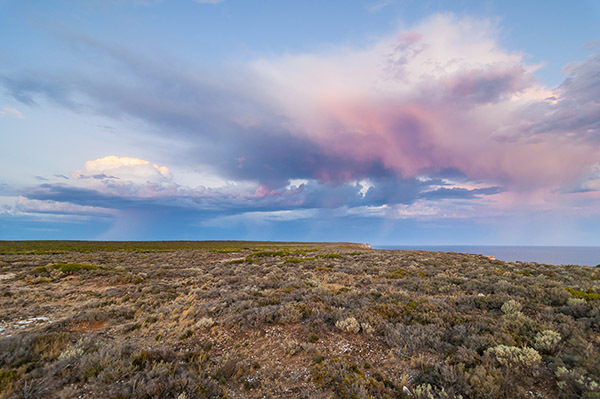 Over the edge of the world’s largest, flattest limestone plateau, where the Leeuwin Current warms the sea, around half of Australia’s southern right whale population gathers each winter, to the delight of Nullarbor travellers. The Head of Bight Visitors Centre guarantees you’ll see these bus-sized whales from June to August as they mate, socialise and give birth before leading their young south into sub-Antarctic feeding grounds. Their presence is safeguarded by overlapping marine sanctuaries that parallel the Nullarbor’s dramatic coastline from the WA/SA border east to Cape Adieu. Closest to shore and declared a whale sanctuary in 1995, South Australia’s Far West Coast Marine Park ranks as one of the country’s three largest whale breeding sites and is shadowed by the much larger Great Australian Bight Commonwealth Marine Reserve that extends far offshore. Creating perfect conditions for whale breeding, the Leeuwin Current brings warmer, less saline waters to the Bight over winter, luring more than 100 southern right whales that give birth to more than 50 calves annually. 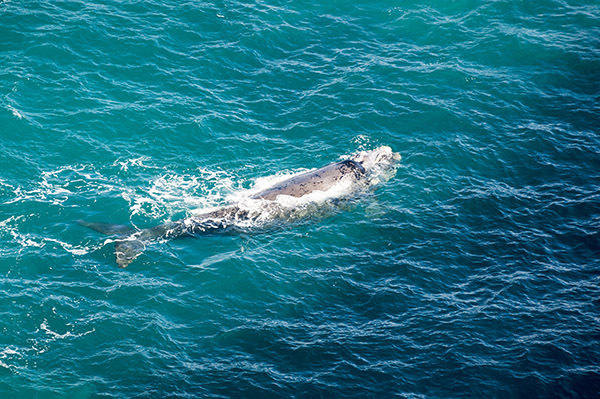 An aerial search over the Bight in June 2014 counted 169 southern right whales, plus a couple of humpbacks too. While humpbacks are known for their haunting song and frolicking behaviour around boats, southern right whales (eubalaena australis) were so named because, sadly, they were the ‘right’ whales to hunt: slow moving and found close to shore, they float when dead and have plenty of oil and blubber. It’s estimated that prior to whaling worldwide numbers of southern right whales ranged from 60,000 to 100,000. But reaching lengths of around 13 metres and weighing up to 70 tonnes, these easy targets were hunted in Australian waters to the brink of extinction. Since gaining protection in 1935 their numbers have slowly increased but this hasn’t kept them off the endangered list. The population is thought to be expanding at the rate of seven to eight per cent per year and the Australian government continues to list their conservation status as vulnerable in South Australia and endangered nationally. You can spot southern right whales right along the Nullarbor coastline over winter but it’s at the Great Australian Bight’s most northerly point that you’ll enjoy the closest encounters. 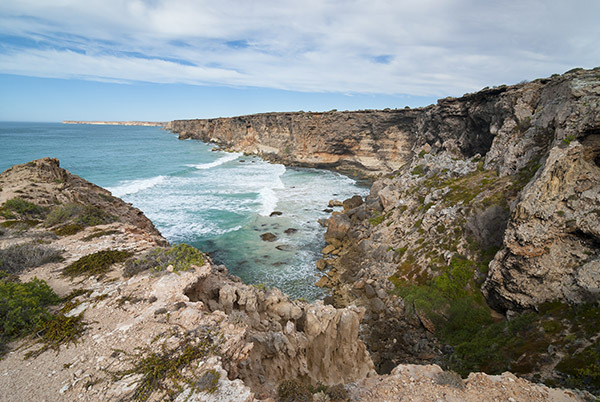 On Yalata Aboriginal Land, 12km off the Eyre Highway, Head of Bight Visitor Centre provides wheelchair and stroller access to a series of coastal viewing platforms and boardwalks that overlook the shallow waters where many whales converge. In June or July you might spot adults rolling around on the water’s surface, mating, while by August when the bay’s season population is at its peak, calves can be seen swimming alongside their mothers. With picnic facilities and an interpretive centre to tour, Head of Bight provides a unique whale-watching experience at an affordable price. Entry fees during the wintertime whale-watching season (1 June to 30 October) are $15 for adults, $12 for concession cardholders, $6 for kids (5-15 years) and $35 per family. When surveyor Edmund Delisser named the Nullarbor in 1867, the obvious lack of vegetation was on his mind. This dry landscape can unhinge visitors with its sheer desolation, but is best described by its Aboriginal name, Oondiri, meaning ‘the waterless’. There are few signs of life, but it wasn’t always so. This low-lying expanse of saltbush and bluebush plains was once the bed of the vast inland sea that created a slab of limestone covering about 200,000km2 and measuring up to 300m thick. When the seabed was finally uplifted around 25 million years ago, water percolating through the limestone carved out an extensive system of caves and tunnels that continues to surprise speleologists. Today, hardy flora and fauna species have taken hold within Nullarbor National Park and the surrounding reserve that together form the largest semi-arid karst (cave) landscape in the world. Here you can spot endangered Nullarbor quail-thrushes as well as peregrine falcons, dingoes, colourful Major Mitchell cockatoos and Australia’s largest population of southern hairy-nosed wombats. Australian hobbies, nankeen kestrels and welcome swallows make use of the cool, dark interiors of around 20 large caverns, some of which lead to underground lakes and passages. By far the easiest to access are the Murrawijinie Caves, a trio of open cave systems located 110km east of Bunda Cliffs Lookout. You’ll find the caves signposted 10.4km west of the Nullarbor Roadhouse at the end of a rough dirt track. Although rugged, it’s navigable by conventional vehicles with care – if you can’t find the track, ask the friendly roadhouse staff. The first of the caves is a collapsed sinkhole with tight, disappearing crawl-throughs. A short drive down the track at cave number two, you can shimmy underground to stand in a voluminous space beneath the mud nests of welcome swallows. But it’s in the third cave that your torch beam will illuminate something truly remarkable – galleries of Aboriginal ochre hand stencils just inside the cave’s wide entrance. This is by far the easiest cave to access, demanding only a sure-footed walk around the tumbledown rocks to reach the cave’s spacious, flat floor. 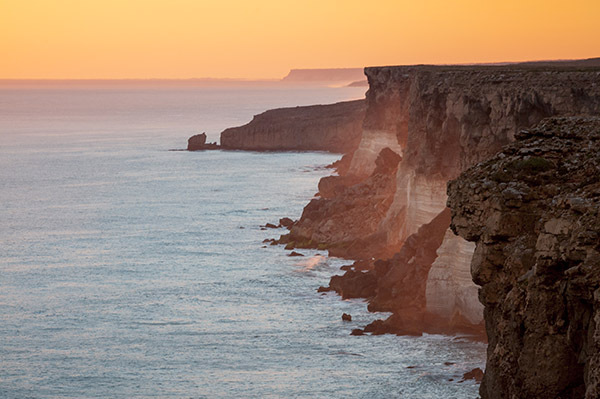 The dramatically undercut Bunda Cliffs that crumble along the Nullarbor’s vast treeless plains provide more solitary and breathtaking vantage points for watching whales. They stretch for 200km along the Great Australian Bight, and the International Hydrographic Bureau (1953) defined this as the longest line of sea cliffs in the world. It’s difficult to resist the urge to stand on the very edge of the country and peer 80 vertigo-inducing metres down to watch the immense waves that end their Southern Ocean ride with spectacular force against the base of Bunda Cliffs. Teetering here, we’ve been lucky enough to spot whales spy-hopping and rolling on the surface. It’s also a very scenic place to wake up. 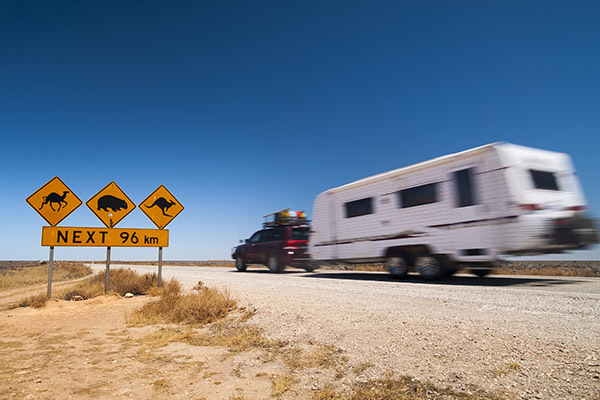 Travelling east of Border Village on the WA/SA border, there are dozens of natural lookouts and pull-offs signposted off the Eyre Highway that give access to incredible views and some very inviting overnight camps too. Bunda Cliffs Scenic Lookout, 75km from the border, is a favourite spot to watch the sunset and rise and a legitimate free camping area that will impress self-sufficient travellers despite its lack of facilities. There’s even plenty of space for big rigs. After one unbearably hot day on the Nullarbor, tormented by unrelenting flies, we parked the van at this magnificent camp and will forever remember the afternoon’s electrical storm, lightning bolts illuminating the cliffs far below and triggering brilliant arcing rainbows as it moved east. Not only did the storm provide a magical end to the day but it cleared the air and sent temperatures tumbling, so by first light we were up and ready to explore Nullarbor National Park. For thrill seekers and photographers, the massively eroded cliff overhangs are a potentially dangerous playing field – explore and camp a safe distance from the abyss and carry a torch when moving around at night.